As the last one among works created in the late Antiquity it is Vita Sancti Severini written in 511 that mentions the town of Salzburg, however, in the more than two centuries following it no written source was produced or left to us that may provide additional information on the history of the settlement and the development of the fate of its Christian community. Our monograph is arranged around Libellus Virgilii, Gesta Sancti Hrodberti confessoris, Liber confraternitatum, Notitia Arnonis, Breves Notitiae, the so-called Carmina Salisburgenia and Conversio Bagoariorum et Carantanorum, i.e., the seven most important sources of the 8th and 9th century from Salzburg following the chronology of the works listed. “Alle mittelalterliche Forschung ist Philologie”—so we have strived to keep this fundamental principle and the criterion of paying respect to sources in view throughout our work. As a further philological aspect of the monograph it can be underlined that regarding each of the sources specified as a starting-point, we have tried to explore their structure, linguistic and stylistic features. In addition to the philological approach, however, the aspects of public, ecclesiastical, cultural and legal history have been given great weight since historical sources of Salzburg could not have been interpreted without in-depth analysis of political processes, answering the questions arising in this respect as much as possible and drawing conclusions from such answers regarding the texts analysed. Regarding the subject of our work it might be righteous to raise the question why the sources of Salzburg have been scrutinized. 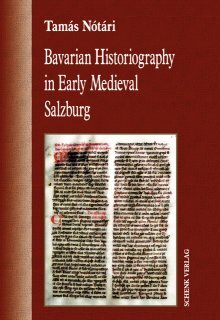 The historiography of Salzburg—and using this term in an extensive sense, we rank under this category hagiography, estate registers and the carmina that have the value of historical sources and narrate historical facts—is highly rich compared to the sources of Bavaria of the period since, albeit, hagiographic works, estate registers and letters were produced also in Freising, Regensburg and Passau, only Salzburg can be proud of Conversio Bagoariorum et Carantanorum, this peculiar genus mixtum so typical of Salzburg. Most of the sources that constitute the subject of the investigation were written not primarily for historiographic purposes, but all of them include the historiographic element; yet, in addition to recording past events, their aim is practical, legitimizing, pragmatic: to determine, record the position, role, significance of Salzburg, which had turned from a modest locus to Bavaria’s intellectual, secular and ecclesiastical centre in the flow of politics having calmed into history. Auch als Kindle eBook erhältlich!